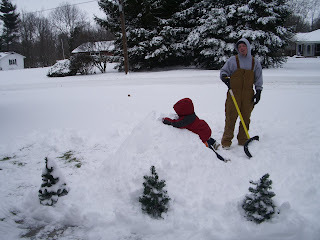 A couple of weeks ago, we here in Catlin got a LOT of snow. Like, 8 inches, or close to that. 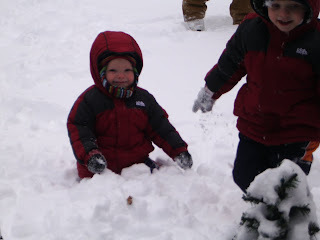 It was our first 'big' snowstorm.....it was so pretty coming down, and they boys were just aching to get out there and play in it. Anyway, back to the boys and their begging....it was a great thing (for me!) that their Daddy was home that day! 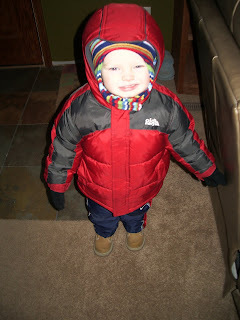 Shane agreed to take them out and play, so I began the bundling process. 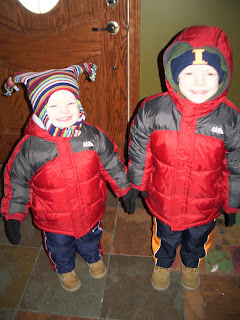 Four shirts, three pair of pants, two pair of socks, one hat, one pair of boots, one coat (with another hat) and 27 minutes later, they were ready to go! What a site. The boys, ready to go! Colin was truly enjoying himself. He thought this was just the greatest thing. 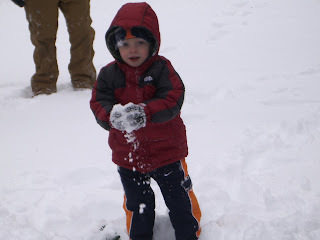 Cameron, on the other hand, thought that this was all sort of neat, but did NOT like getting snow on his gloves or his face. If that did happen, he would go walking over to Shane, calling for him to "help me, Daddy!" It was really cute, and despite him not being very sure of the whole thing, he hung in there for a good length of time. 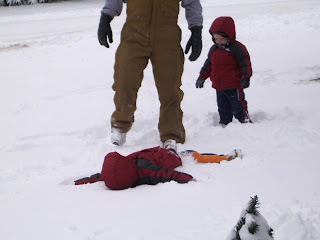 As the boys began to tire of just 'playing' around in the snow, Shane had a bright idea. 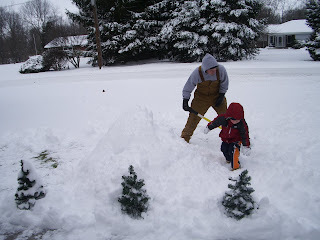 Build a snow mountain! Colin especially thought this was the coolest thing! 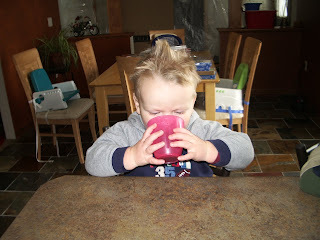 He immediately turned it into a sliding apparatus, climbing to the top and going down on his belly! 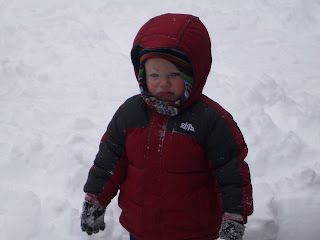 ....he was not a happy camper. That was basically the end of the outside adventure for Cameron. He really never recovered from the face-plant. 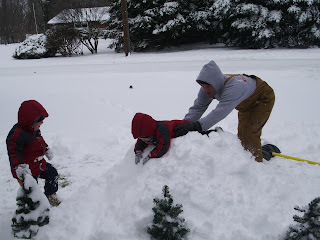 They all played for a couple more minutes, while I ran inside and whipped up some hot chocolate for all three of them. Ah, a day that gave us many memories! Love it dev! 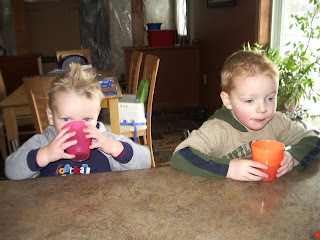 how cute are your kids!!!! 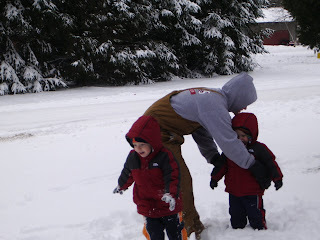 (The little ones not the big kid out in the snow);) can't wait to see you guys again! maybe we can plan something soon. A weekend away maybe??? we will see though. rog just started up another 8 week sunday school class. too cute! 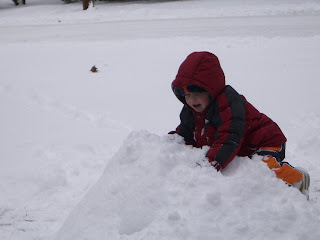 We just got back from tons of snow and I think caden could have stayed out there forever! This post reminds me of myself. 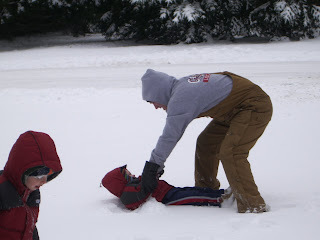 I am always pawning off playing in the snow to my husband too! I'll be out there long enough to take pictures then I head inside and get ready for when they come back in. 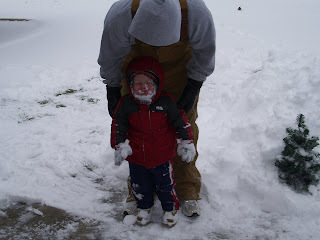 Our husbands dress alike, at least when it comes to the snow. Deric is always in his carhart overalls, his hooded sweatshirt, and his work boots.